Why is Virtual Reality so important for the faith? Good News Ministries is becoming a leader in the Catholic Church for VR evangelization and faith-based, immersive events. Recently, I read an article by Soumen Ganguly at techcrunch.com, which I’m paraphrasing here to reveal how and why we can successfully use it for evangelization and faith growth. 1. Multiple uses. VR is immersive. Change within us happens when we are immersed in an event, not being merely spectators. This experience is already useful, not only in games, but communications, healthcare, education — and (here’s where we come in) the Church. VR has given industrial executives the ability to take an immersive tour of a manufacturing facility from thousands of miles away. Similarly, we can give immersive tours of churches and beautiful cathedrals to the general public. Companies that have splashy, public launches of new products (such as Apple) are planning for the day when anyone anywhere can join the event via VR experiences. Good News Ministries is working toward retreats, courses and conferences that anyone anywhere can attend and feel like they are really in the middle of it. 2. Diverse, high-quality content. VR is attracting the creative interest of an important balance of providers (TV, movies, social media) and at-home users. This critical mass of professional and amateur producers is driving the technology forward. 3. Falling device prices. Just a few years ago, VR cameras were prohibitively expensive for most consumers. But recent entries to the market make it possible to film VR content for less than $400. 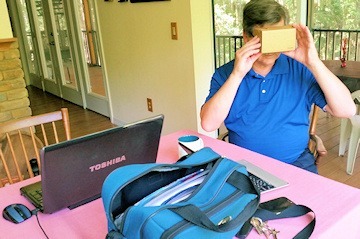 And to view it, a person only needs a pair of cheap cardboard goggles (provided by Google for $15, or follow their instructions to make your own for much less) and a smartphone app to start the VR experience. Or view it without either — though less immersive, it still creates a “Wow!” experience to view it on a computer screen. 4. Budding startup ecosystem. Many small, innovative companies are popping up to help drive VR growth. Good News Ministries is positioning itself to do that within the Church. We’re even ready right now to teach youth groups and other religious organizations how to get started and how to film this new kind of videography. Someday we’ll teach it via immersive VR workshops; we’re not there yet. The “wow factor” is helping VR to succeed. Our first VR retreats have been a big hit. They provide you with a personalized experience that you can control. Weekly, we’re adding new things to see, new prayers to do, and/or new messages, turning our original VR retreat space into a Good News VR WORLD. Download GNM’s strategic plan for more details on how we’re going to accomplish the goal of becoming leaders in the Catholic Church for VR evangelization and faith-based, immersive events. The biggest reason why we should be excited about VR is its potential for changing hearts for Christ. This entry was posted in Exploring VR on August 5, 2016 by Terry Modica.